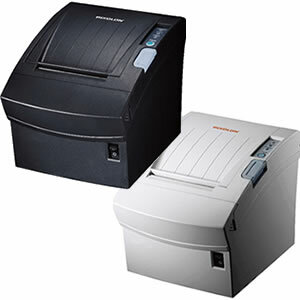 Below are listed our most popular receipt printers that are suitable for retail and restaurant use. These include thermal receipt printers and impact printers. The latter are suited for kitchen / bar printer use. 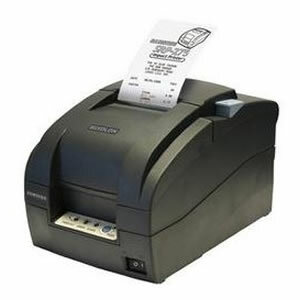 We can also supply other types of receipt printers. Fast 250mm per second maximum printing speed. Prints text, graphics, barcodes and logos. Compact size with small footprint and auto-cutter. 180dpi print resolution. Includes RS232 Serial, USB and Ethernet interfaces as standard as well as Cash Drawer (24v) kickout port. Pack includes RS232 serial cable. Fast 230mm per second printing speed. Prints text, graphics, barcodes and logos. It has a paper sensor with audible alarm that warns you when a paper roll is about to finish. Available with RS232 Serial interface. 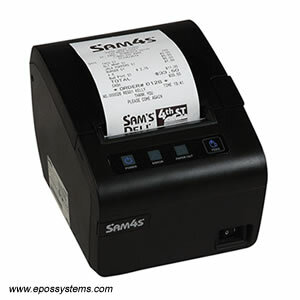 Fast thermal receipt printer with 200mm/second print speed. Auto-cutter option. Available in black or white coloured casing. Standard model: RS232 Serial and USB interface. Impact dot-matrix printer, suited for kitchen / bar order ticket printing. Built in buzzer alarm. Internal power supply. Single or 2 colour (black / red) printing with ink ribbon. 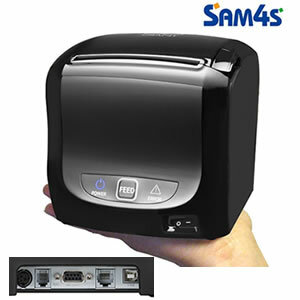 High speed industry-leading thermal receipt printer with upto 300mm per second print speed for text and graphics. Standard model: USB interface, with UK power supply and power cable. High speed printer with water-resistant design and front exit slot for paper. 270mm/second print speed, 180/203dpi print resolution. All in one USB / Serial / Parallel / Ethernet interfaces as standard. 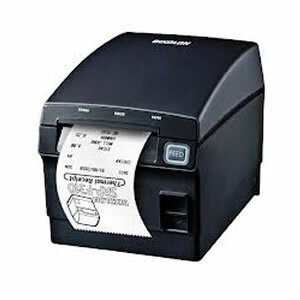 Receipt printers are generally available as mini thermal printers or mini impact (dot-matrix printers) with a print width between 57mm and 80mm. Thermal printers print onto thermal paper using a heated print head and dont require any ink ribbons/cartridges. They are also very fast, silent and are capable of printing text and graphics at high speed. Impact printers require an ink ribbon or ink cartridge, make a noise while printing, and may have limited character/graphics capability. Impact printers are more useful for kitchen printing, where thermal paper may not be suitable due to heat and moisture. They are also suited where a higher quality permanent print is required or where you wish to print onto slips, vouchers, coupons, 2-ply or 3-ply stationery. There are many brands of receipt printer on the market. However as receipt printing is such a critical operation which could stop your store from trading if it fails, we generally recommend the main brands Epson, Bixolon and SAM4S. 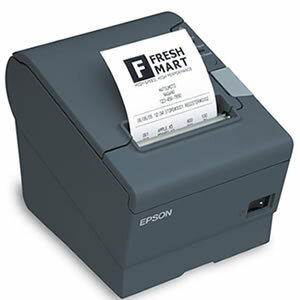 The Epson TMT88IV and TMT88V are very widely used thermal receipt printers throughout the retail industry. The SAM4S Ellix-20, Bixolon SRP350 and SRP350plus are also very popular and proven choices. If you will be printing graphics on your receipt such as your logo, or using it also for kitchen printing (eg. chinese characters), then make sure your chosen EPoS printer supports these features. If your EPoS software supports it, receipt printers can also provide an auto-cutter facility so the receipt is automatically cut when printed so it can be simply lifted off the printer. The alternative tear-bar versions require you to tear-off the receipt manually which can slow you down in a busy retail environment. For the EPoS packages we provide, we will ensure the chosen receipt printer has the correct interface for the connection to the PC. If you have your own PC equipment, you should check the interface ports available on your hardware before choosing either USB, RS232 Serial, Parallel or Ethernet interfaces. If you will be using your own EPoS software, you should also check which interfaces it can support. Friday 19-April-2019 23:10 Our office is currently closed. We will be open again from 10am tomorrow.